Papworth Astronomy Club held their third open evening on Wednesday, March 7 in the splendid surroundings of the Bradbury Progression Centre, Papworth Hall. The even included a series of video presentations, a slide show by Keith Tritton entitled “Galaxies”, the opportunity to use a range of hands-on astronomy computer software, and a display of telescopes and accessories laid on by Green Witch from Cambridge. 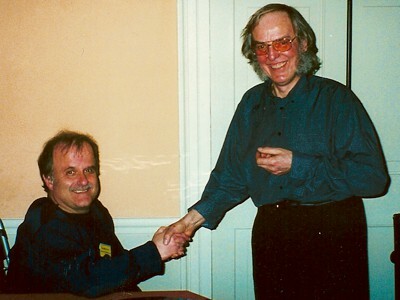 This year, the special attraction was Colin Pillinger from the Open University, who demonstrated the British Beagle 2 Mars Lander, scheduled for launch in 2003. A capacity audience was enthralled by Prof. Pillinger’s talk about the search for life on Mars.